An hourly employee is paid on an hour-by-hour basis, which sounds simple The old image of an hourly worker was a line of factory workers punching time clocks. Today, there are many different types. Most are paid on an hourly basis, including workers in construction, manufacturing, wholesale trade, retail trade, transportation and warehousing, information, leisure and hospitality, and government. Pay for an hourly employee is calculated as hours worked times rate. Employers are not required to pay hourly employees for time not worked, and there is no minimum number of hours a week that an hourly worker must work. All workers in the United States, both hourly and salaried, must be paid at least the minimum wage (currently $7.25 per hour), for all hours worked. Hours can often be accounted for with a time clock, but all hourly employees must provide an accounting of their work hours for each week or two-week period. 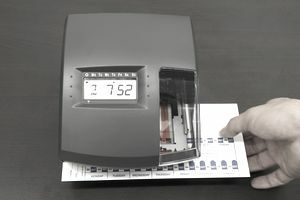 That accounting can be on a time sheet or electronic time sheet, but the account must be verified and is used for payment. Hourly workers are considered at-will employees. That is, both the worker and the employer can change the relationship at any time, with or without notice. Hourly employees typically do not have employment contracts, but some hourly workers have union contracts. If an employer is in financial difficulty, it might reduce wages or lay off hourly workers. Of course, there are exceptions to the at-will employment doctrine. Employers can't discriminate against workers, or fire for whistleblowing or a number of protected activities. Overtime is a big dividing line between hourly and salaried workers. Hourly employees work in the types of jobs that classify them as non-exempt. That is, they are not exempt from overtime, and employers must pay overtime to hourly workers. The Fair Labor Standards Act (federal law) says that employers must pay hourly workers overtime if they work more than 40 hours in a workweek, and the overtime rate must be at least 1 and 1/2 times the normal hourly rate. Some employers choose to pay additional overtime at higher rates for work on holidays, for example, but this is not required by federal law. A worker can be designated as full-time for several purposes, including by an employer for the purposes of benefits. A 40 hour work week is considered full-time for the purpose of calculating overtime. For the most part, hourly employees are non-exempt, as discussed above. That is, they are eligible for overtime pay. Certain employees are considered exempt from overtime because of the types of jobs they do - executive, managerial, professional. In many businesses, hourly employees and salaried employees are not only paid differently but they may receive different types of employee benefits. For example, hourly employees may not be eligible for the same paid time off (sick pay, holidays, vacations) as salaried employees. Federal law does not require employers to pay for time off or for rest breaks. It was true historically that union workers were mostly paid by the hour, but that's not really true today. Many salaried employees have formed unions, including public school teachers. Yes, if an hourly worker is required to travel or drive on business-related activities, at the request of the employer, travel time should be accounted for and included in the employee's pay. Employee travel expenses must also be reimbursed. Each state in the U.S. has different laws from other states, relating to overtime, child labor, rest breaks, and others. The U.S. Department of Labor has a website that includes links to state laws regarding hourly employees.